WASHINGTON, D.C. – The 2017 Monitoring the Future survey released today shows that youth cigarette smoking continues to fall, but raises fresh concerns about the popularity of electronic cigarettes and cigars among youth. The survey found that far more 12th graders vaped e-cigarettes than smoked regular cigarettes in the previous 30 days – 16.6 percent reported any vaping, including 11 percent who reported vaping nicotine, versus 9.7 percent who smoked cigarettes. In addition, more 12th graders reported smoking flavored little cigars than cigarettes – 10.1 percent to 9.7 percent. These findings underscore the need to prevent youth use of all tobacco products and stop a new generation of products from undermining the great strides our nation has made. The Food and Drug Administration should fully implement its new rule for e-cigarettes and cigars without delay, and Congress must reject pending proposals, contained in a House appropriations bill, to weaken FDA oversight of e-cigarettes and cigars. The proposals before Congress would completely exempt some cigars from FDA oversight and limit FDA oversight of e-cigarettes and cigars already on the market, including products with sweet flavors like gummy bear, cotton candy and banana smash that attract kids. Tobacco lobbyists are pushing to include these special-interest giveaways in the appropriations bill Congress must pass to keep the government open. Congress should reject these harmful proposals, which would make it easier for manufacturers to continue marketing candy-flavored e-cigarettes and cigars to kids. Congress should also reject a House appropriations proposal to cut funding for the CDC’s tobacco prevention and cessation efforts by nearly 25 percent. 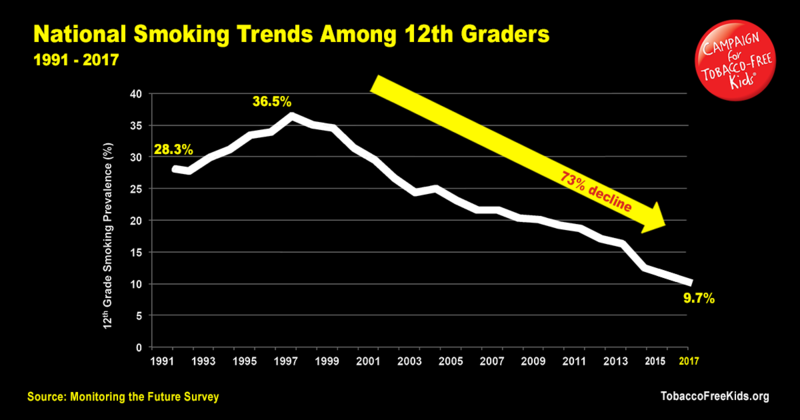 The good news in today’s survey is that the dramatic, decades-long decline in youth smoking is continuing. For grades 8, 10 and 12 combined, all measures of cigarette smoking – lifetime, 30-day, daily and half-pack/day – are at historic lows. Since peaking in the mid-1990s, past-30-day smoking rates (considered current use) have fallen by 73 percent among 12th graders (from 36.5 percent to 9.7 percent), by 84 percent among 10th graders (from 30.4 percent to 5 percent) and by 91 percent among 8thgraders (from 21 percent to 1.9 percent). For the first time, the smoking rate is under 10 percent for 12th graders. These declines will translate into millions of lives saved. In addition to the 10.1 percent of 12th graders who reported using flavored little cigars, 5.6 percent used large cigars and 6.6 percent used regular little cigars (the survey did not provide an overall number for use of any cigars). This survey is a reminder both that we know how to win the fight against tobacco and that this battle is far from over. To keep making progress, elected officials at all levels must fully implement proven strategies. These include higher tobacco taxes, comprehensive smoke-free laws, well-funded tobacco prevention and cessation programs, effective FDA oversight of all tobacco products, and hard-hitting media campaigns, like the campaigns conducted by the CDC, the FDA and Truth Initiative in recent years. In addition, states and localities should continue to raise the tobacco sale age to 21, as five states and over 280 cities and counties have now done. The FDA should also take several critical steps to accelerate progress: implement its new plan to limit nicotine in cigarettes to minimally addictive or non-addictive levels, and apply this limit to other combustible tobacco products; require graphic health warnings covering at least half of cigarette packs, as a 2009 law mandated; and prohibit the use of menthol in cigarettes and flavors in other tobacco products, which have been shown to promote youth use of these products (flavors in cigarettes, other than menthol, were prohibited by the 2009 law). Until the FDA acts to prohibit flavors in all tobacco products, states and localities should continue their growing efforts to prohibit and restrict the sale of these tobacco products. Despite our progress, tobacco use is still the No. 1 cause of preventable death in the United States, killing more than 480,000 Americans and costing $170 billion in health care expenses each year. We can win the fight against tobacco, but only if elected officials put America’s kids and health before the special interests of the tobacco industry. The Monitoring the Future survey has been conducted annually since 1975 by researchers at the University of Michigan’s Institute for Social Research and is funded by the National Institute on Drug Abuse.